Form: This small temple is a kind of cross between the Pantheon and the Parthenon. It has a dome and is a central plan like the Pantheon but uses a different order, the Doric as in the Parthenon. It is also contained within a small courtyard that was not part of its original design. Originally, the building was to be placed in a circular colonnaded courtyard which was designed to "set off" the design of the temple itself. According to the Brittanica, the building was "specifically inspired by the temple of Vesta at Tivoli." Iconography: The use of a classical design that refers back to the Parthenon and Pantheon is designed to give the building an antique and therefore authoritative and classic feel. The circular shape is almost like a target from above and would have been even more powerful as an icon if Bramante's original plans had been followed. As it is, the buildings shape and design are also very appropriate because the symmetrical design plays into its function which was to focus the attention of the monument on the site where St. Peter was supposedly martyred. Context: The construction of the Tempietto was commissioned by Ferdinand and Isabella of Spain. It's name is actually an affectionate kind of nickname. Tempietto is an Italian nickname for small temple. This building is specifically important in terms of context because it allowed Bramante to explore some ideas that he would later on use in his design of St. Peter's Cathedral which was rebuilt, at least at first, in central style plan. 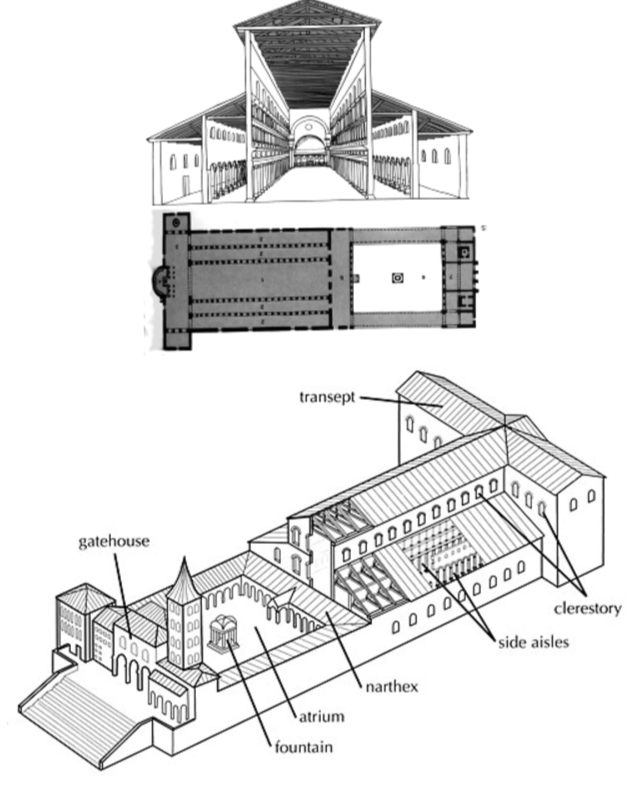 The Original Plan for St. Peter's from 315 CE looked nothing like it does now. Context: In 313 AD the Roman general, Constantine, possibly sensing the change in religious climate, had a miraculous dream and after his victory over Maxentius he adopted Christianity as the official religion of the Roman Empire with his "edict of Milan." After this happened, Roman Christians naturally adopted the traditional Roman art and architectural styles for use in the worship of Christianity. "Basilica" is a Greek word meaning "honored" and it is possible that for this reason one of the most used architectural form is the basilican plan which was used in the design of Christian churches. The original building was torn down and new one was designed by Donato Bramante in 1502 to replace it. Bernini 1637 (bottom) Form: The Plan of St. Peter's goes through several radical changes over time. It started as a basilican tau plan ("T" shaped) in 315 CE. When Pope Julius ordered the original building torn down Bramante designed the building to be based on a Greek cross central plan. Unfortunately, Bramante's design was a little unstable and Sangallo redesigned the plan. Sangallo and Michelangelo both thickened up the walls and slightly simplified Bramante's original design. Michelangelo also redesigned the dome and the facade of the structure. His design was to create a more egg shaped or pointed dome than Bramante's original design because the shallow half sphere of Bramante's design was structurally a bit unstable. Michelangelo's design was then completed by Giaccomo della Porta in 1590. Carlo Maderno in 1607-15 didn't so much redesign the building but add to it. Maderno lengthened the nave of the cathedral converting it from a central plan to a Latin cross basilican plan which makes the building appear as a crucifix from above. Bernini's arms were commissioned by Pope Alexander VII (1655-67). Bernini created the egg shaped atrium/plaza that are the "arms" of St. Peters. The shape of the entire structure then appears to look like a key from above. The brick dome 138 feet in diameter rises 452 feet above the street, and 390 feet above the floor, with four iron chains for a compression ring. Four internal piers each 60 feet square.The dome is 452 ft high (above the pavement) and is buttressed by the apses and supported internally by four massive piers more than 18 meters (60 feet) thick. —taken from John Julius Norwich, ed. Great Architecture of The World. p153. 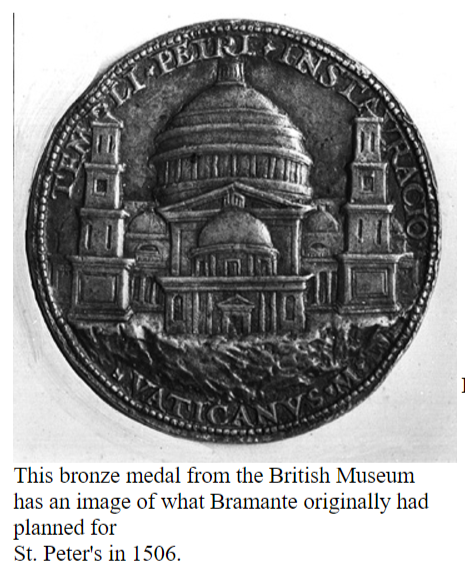 "The medal by Caradosso (1506) and the partial plan drawn by Bramante (in the Uffizi, Florence), probably represent the earliest stage of the design, before the difficulties appeared which obliged the architect and his successors to propose, and in some cases implement, numerous changes. These changes related not only to the general conception of the plan—first a Greek cross, then a Latin one—but also to the plan of the transepts, which at one time were to have ambulatories; to the role of the Orders, first purely decorative (Bramante), then structural (Raphael, Michelangelo); and to the construction and shape of the dome, first with a single masonry shell (Bramante), then a double one (Sangallo, Michelangelo). The piers at the crossing, which were intended to support the dome, were one of the biggest problems; too slender in Bramante's plan, they were frequently reinforced... In the 17th century further important modifications were made by Bernini when he created the great colonnade that encircles the Piazza San Pietro." —John Julius Norwich, ed. The World Atlas of Architecture. p276. Here's what Sangallo's version of St. Peter's would have looked like based on his model. Models were not toys in the Renaissance. They were working experiments in which the architects tried out ideas, explained concepts, competed for commissions and instructed their workmen. At a time when paper was still something of a novelty and masons could be illiterate, models were more important to the actual building process than were plans. Dozens of models were used in a major work of construction. Most of these were destroyed after their period of usefulness was over. But some lavish ones created for display have survived--including the colossal model, built to the design of Antonio da Sangallo the Younger, for St. Peter's Basilica at the Vatican. Sangallo's team, made up of highly skilled craftsmen led by Antonio Labacco, spent seven years on this detailed study of every major structural and decorative element in a church that was never built. Michelangelo changed the design after Sangallo's death--two of Michelangelo's own models for parts of the revised church were also in the show. The occasion for the show was the careful restoration of the Sangallo model, which itself took three years. Rotted wood was replaced with synthetic materials, stains were removed, delicate railings were re-created. Some things were not replaced--the paint imitating stucco and travertine, the row of statues around the lower tier of the dome, the metope reliefs in the frieze that runs around the whole structure, and various candelabra. But the basic elements are now restored, and are stunning. Vast quantities of fir, lime, elm and apricot were turned, carved, stamped and fitted with endless patience and ingenuity. The restored model was first taken to Venice, where most of the surviving Renaissance models were displayed around it in the Palazzo Grassi. Only half of these 28 models accompanied Sangallo's masterpiece to America. "St. Peter's." Britannica 2001 Standard Edition CD-ROM. Copyright © 1994-2001 Britannica.com Inc. November 30, 2002. Protected by the fortified Castel Sant'Angelo, St. Peter's Basilica and the Vatican Palace gained precedence over the cathedral church and Lateran Palace during the papacy's troubled centuries. St. Peter's was built over the traditional burial place of the Apostle from whom all popes claim succession. The spot was marked by a three-niched monument (aedicula) of AD 166-170. Excavations in 1940-49 revealed well-preserved catacombs, with both pagan and Christian graves dating from the period of St. Peter's burial. Constantine enclosed the aedicula within a shrine and during the last 15 years of his life (died 337) built his basilica around it. The shrine was sheltered by a curved open canopy supported by four serpentine pillars that he brought from the Middle East. The design, enormously magnified, was followed in making the baldachin (1623-33) over today's papal altar. In spite of fires, depredations by invaders, and additions by various popes, the original basilica stood for 1,000 years much as it had been built, but in 1506 Julius II ordered it razed and a new St. Peter's built. 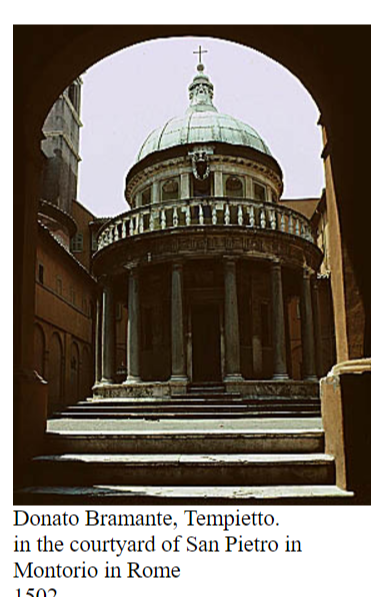 His architect was Donato Bramante, a Florentine who in 1502 had completed the first great masterpiece of the High Renaissance, the Tempietto in the courtyard of S. Pietro in Montorio, a mile away on the Janiculum Hill. Built to mark the spot where, according to tradition, St. Peter had been crucified, the Tempietto is round, domed, and unadorned. Its outer face is a colonnade of bare Tuscan Doric, the earliest modern use of this order. Because of its proportions, the tiny temple has the majesty of a great monument. Bramante's ground plan for St. Peter's was central: a Greek cross, all of the arms of which are equal, around a central dome. Both he and the Pope died before much could be built. Successive architects, including Raphael, drew fresh plans. The last of them, Antonio da Sangallo, died in 1546, and the 71-year-old Michelangelo was solicited to complete Sangallo's projects, which included St. Peter's, the Palazzo Farnese, and the Capitol. He accepted but refused payment for his work on the basilica. Michelangelo adapted Bramante's original plan, the effect being more emotional and mighty, less classically serene. Of the exterior, only the back of the church, visible from the Vatican Gardens, and the dome are Michelangelo's. After his death Giacomo della Porta and Domenico Fontana, who executed the dome, altered the shape, making it taller and steeper than the original design. The east end remained unfinished, and it was there that Carlo Maderno was ordered to construct a nave, the clergy having won its century-long battle to have a longitudinal church for liturgical reasons. Thus, St. Peter's orientation reverses the normal. Maderno added a Baroque facade in 1626. He was followed by Gian Lorenzo Bernini, who worked on the building from 1633 to 1677, both inside and outside. His pontifical crowd-funnelling colonnade in the shape of a keyhole around the piazza, a fountain for the piazza, the breathtaking baldachin, his several major pieces of sculpture, his interior arrangements for the church, and his dazzling Scala Regia (Royal Stair) to the Vatican exhibit his legendary technical brilliance and his masterful showman's flair. Before the lamentable assault in 1972, which damaged the sculptural masterpiece, one could enter the church and, in the first chapel at the right, see the "Pieta" (1499) of Michelangelo in the original splendor. All the planning, plotting, labor, and faith of all the popes, priests, artists, and artisans produced a vast, gorgeous ceremonial chamber. Amid the gleam and glitter of gold and bronze and precious stones eddy throngs of awed, dwarfed humanity.